Today is Poush Sankranti or Makar Sankranti in West Bengal which is the last day of the Bengali month Poush. The same time this day is celebrated in other states of India too. Like Bihu in Assam, Pongal in South India, Lohri in Punjab, Hadaga Festival in Maharastra Etc. Actually this is a harvest festival and different states call it in different names. But all over the India celebrate this harvest festival. 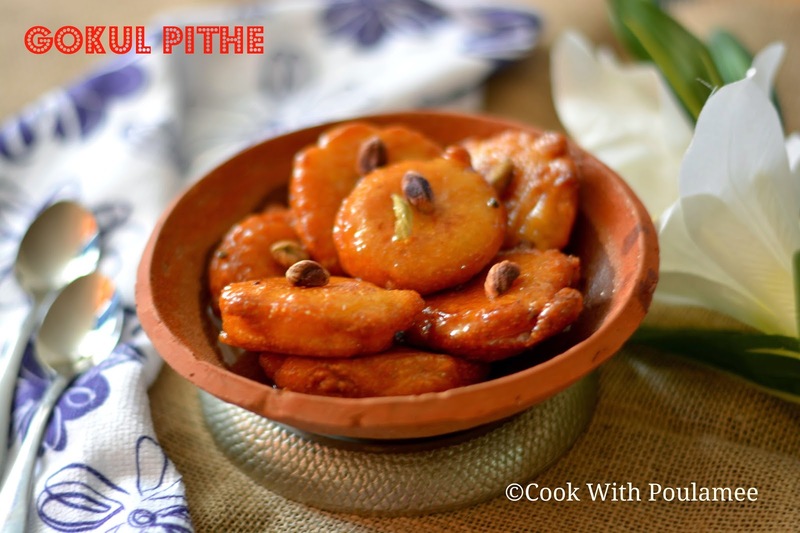 Sweet dish never makes me feel tired and for that today also I prepared some Poush Sankranti special sweet dish or Pithe. 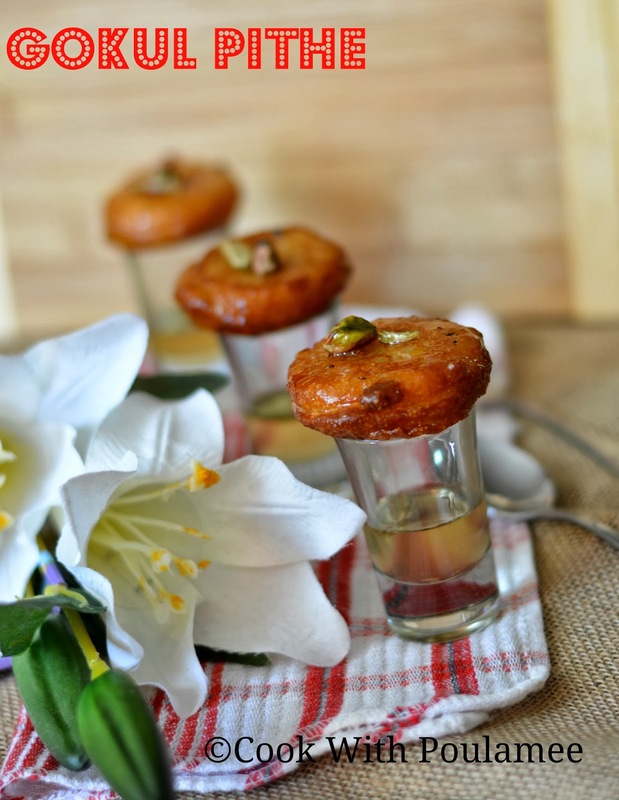 This sweet is a very old and authentic dish, I learnt the recipe from my mother. I can say my maa is an expert of making all kind of sweet dishes. 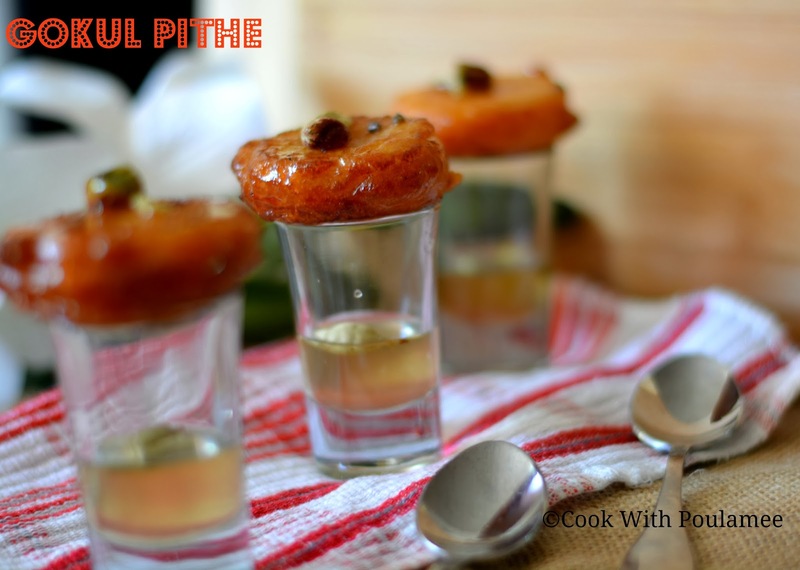 The ingredients are normal like other PITHE but the taste is really out of the world. 1.One large cup shredded fresh coconut. 3.Two table spoon milk powder. 4.Milk: 1 1/2 cup if needed use some more. 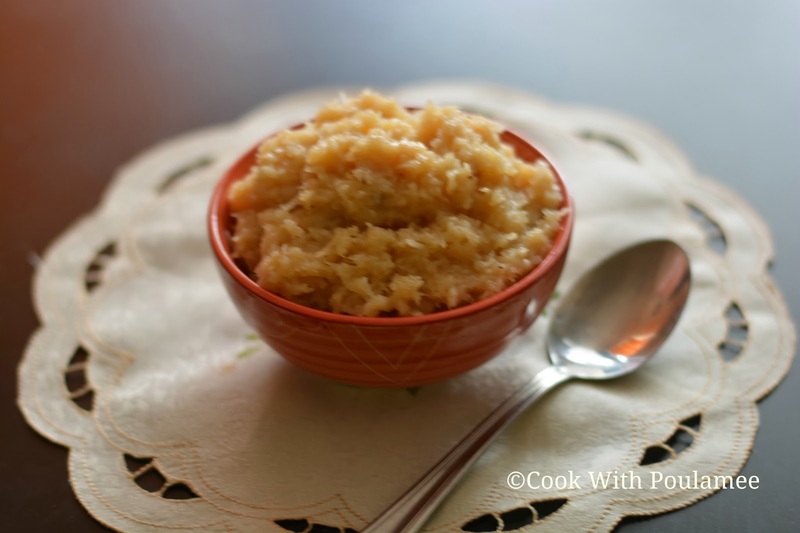 In a large heavy bottomed vessel add the shredded coconut and sugar first and stir with a wooden spoon till the sugar melts completely. Now add the milk and the milk powder and cook this in medium heat till the coconut milk mixture become dry and sticky now add the freshly crushed cardamom and mix well. Now the pur or stuffing is ready. 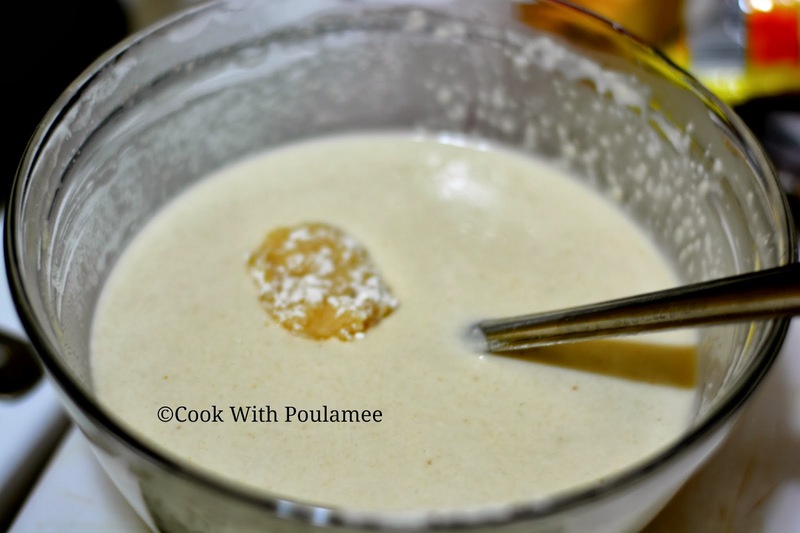 In a large bowl add the flour, semolina, sugar, salt, baking powder and ghee first then mix with a spoon, then add the milk and make a batter, it must be thicker than pan cake batter but not too much thick. 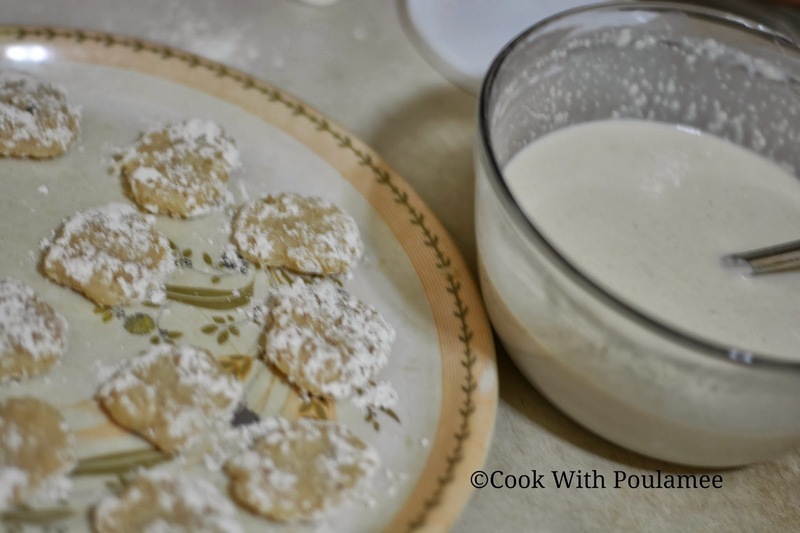 Now make some small flat round shape balls with the stuffing and sprinkle some flour on them. Now first make the sugar syrup, add the sugar water and cardamom in a vessel and allow it to boil, and boil it for 3 to 4 mints and your syrup is ready. (The syrup need to be medium thick). Now add enough oil in a karai for deep frying the Pithe’s. 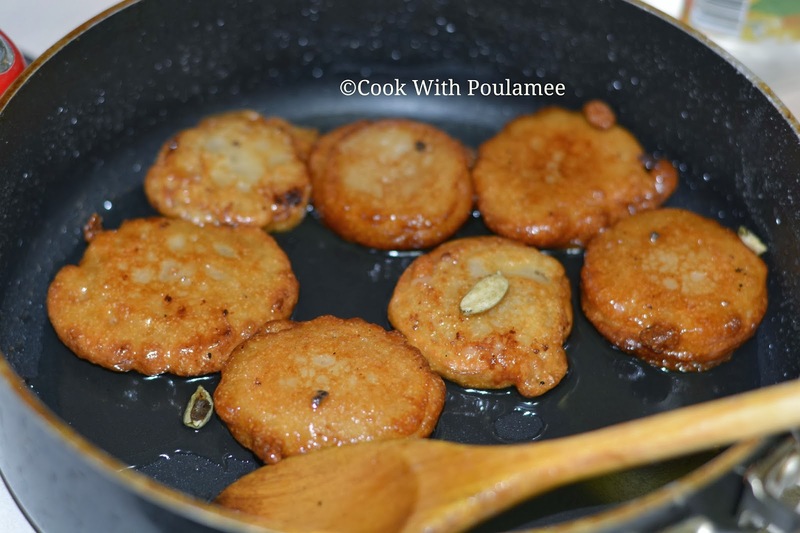 Now take one flat stuffing ball and pour that into the batter and take out the ball with batter and slowly place it into the karai. And fry them till both the sides turn golden brown. 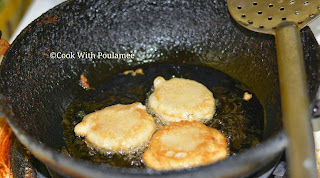 Now this way makes all the GOKUL PITHE, after frying soaked them into the sugar syrup. 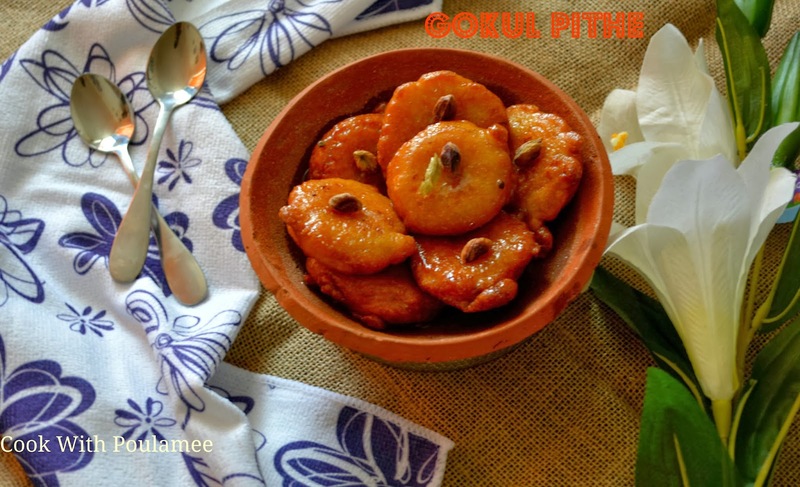 You will see the quantity of sugar syrup will be reduced that mean the pithe’s soaked the syrup properly and your GOKUL PITHE is done. 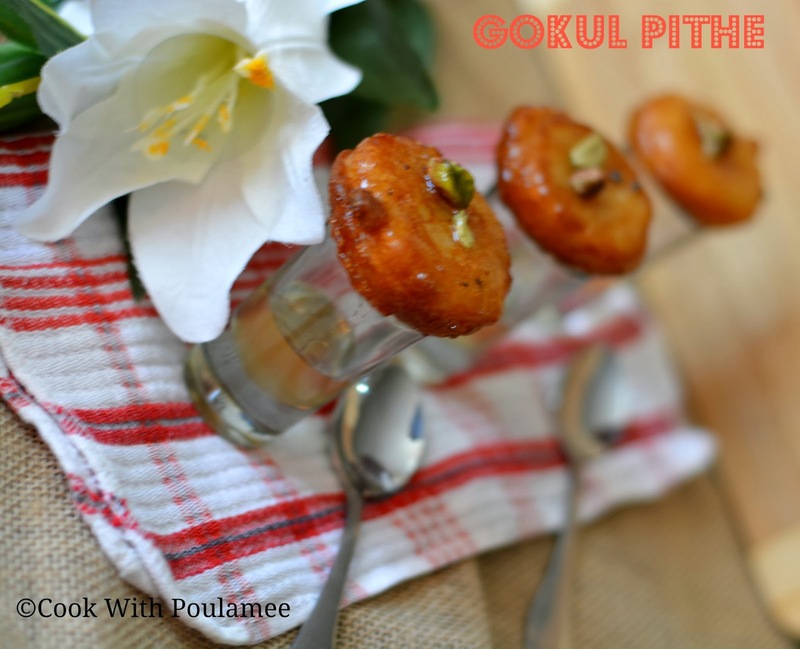 Serve hot or cold enjoy your GOKUL PITHE.